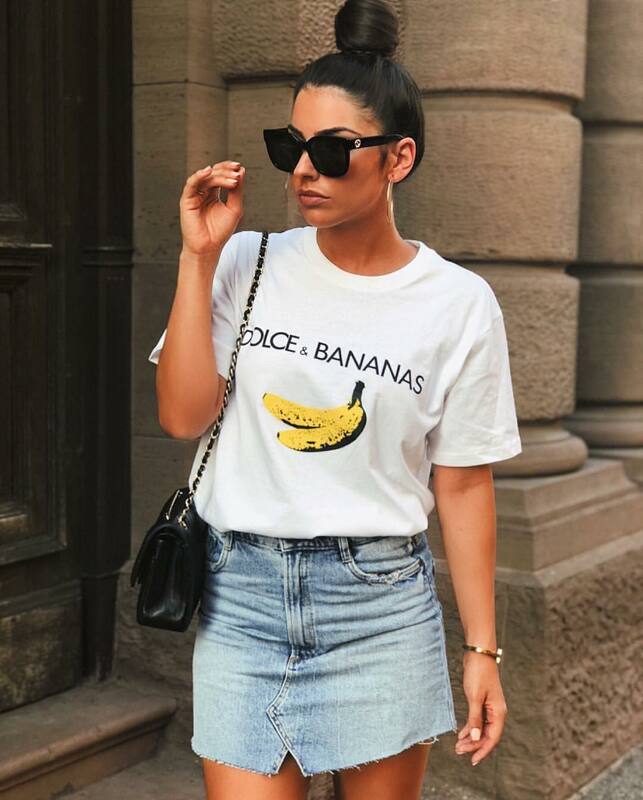 If you do like the casual style for daytime, then go for this basic white T-shirt with a graphic print tucked in a wash blue denim mini skirt. A simple combo for casual street walks. Complete it with oversized sunglasses, gold hoop earrings, and black leather shoulder clutch bag. Beautiful style for your next Summer getaway. We see a beige tank top tucked in white mini skirt completed with a wide belt and cute black leather half moon clutch bag. An ideal style for Summer months. Would you give it a try? Stunning outfit for loud Summer parties. We see a gold sequined bodysuit teamed with a ruffled red mini skirt and heeled ankle-strap sandals. An ideal combo for young ladies who want to make a wow impression on the streets. Have a look at this stunning all black outfit idea for Summer airplane trip. We see a black silk blouse tucked in high-rise black leather mini skirt with side criss-cross lace-up. The combo is completed with black high-heeled sandals encrusted with crystals. Go bold this Spring season by wearing an all-black outfit. We see a black pullover tucked in a black leather mini skirt with fringes completed with white sneakers. Get inspired by this fantastic dusty pink wrap mini skirt. It can be a good choice to combine with a white blazer and lightweight white silk blouse. A perfect smart-casual Summer outfit for young ladies who want to look ladylike and dressy.